7.62 points at 37 votes (rank 168). 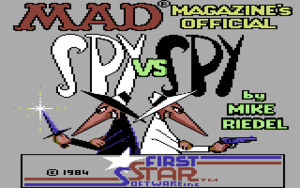 The two opposing spies from the "MAD" magazine, "Black" and "White" meet in this game for the first time on the C64. Both have the mission to steal secret documents from a foreign embassy and then reach the waiting airplane on time. The player can compete against the computer or a human opponent, which of course makes the whole thing more interesting. 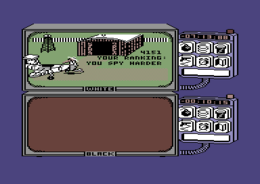 Every spy can move independently from the other through the horizontally parted screen (split screen) and make his action. In one of the rooms of the embassy in one of the fitments a briefcase with secret documents is hidden, which poses the main aim of the spies. But as there is only one exit in the building and this is guarded by a security agent, the briefcase must be filled with the following four items to satisfy him: passport, money, key and secret plans. The found items are shown at the right in the box and flash when they are inside the briefcase. As also in the comic, the two spies have the possibility to set traps for each other. There are bombs or steel springs that can be hidden, spring guns can be built, acid canisters can be put on the top edge of the door or a time bomb can be laid down. But for almost every trap there is also a remedy: umbrella against the acid, pliers against steel spring etc. Only the time bomb mercilessly explodes after 15 seconds. Certainly every spy can also walk into his own trap, that's why you should keep in mind where your own traps are. Such a trap doesn't cost a life by time units. The screen is split in two. 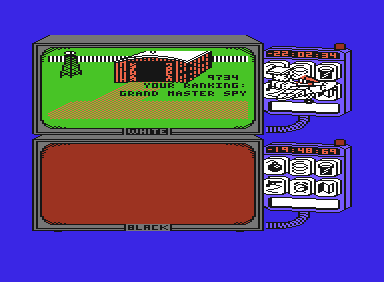 In the upper part plays the white and in the lower part the black spy, at the same time two players or one player against the computer. The rooms are shown in pseudo 3D design. When both spies meet one screen is switched off. The design is functional, nevertheless comic-like and funny (especially when a spy walks into a trap) and also the animation when a spy has won the game is designed "MAD"-like. This is automatically called up when both spys are in the same room. During this time the trapulator cannot be used, but doors can be opened (and by this you can take flight). If the spys get close enought they can fight each other with sticks. To beat down with the stick press fire button while moving the joystick up and down. To stab with the stick press the fire button whike moving the joystick left and right. To move the spy let the fire button go while moving the joystick. Traps get lost but the briefcase and the items of the inventory are hidden in the room. It is placed at the right next to the screen part of each spy and contains the four basic functions: at the very top a digital watch going backwards shows the time left, below that there are six buttons, the first five (bomb, spring, bucket, pistol with rope, alarm clock) are for choosing the traps, with the sixth button an overview map can be called up with which you can determine your position in the building (the room in which you are flashes, the rooms with a dot contain the desired items) and in the lower line the found items are shown (passport, money, key, secret documents). All four items in this line must be flashing, i.e. they need to be collected when the spy holds the briefcase in his hands (grey case), then the exit to the airport can be used. Press fire button twice to control the trapulator. With the help of the joystick move the arrow tot he desired trap and press fire button to select it. The spy now holds the trap in his hand. Place the spy in front of the fitment (box, door, shelve) at which you want to install the trap. A short flicker of the room shows that the spy has reached the right place. Press the fire button once again and the trap disappears from the hand of the soy and is installed properly when you hear a short beep sound (when the trap is installed some time will be subtracted from your account). When installin the spring gun, only the pistol disappears and instead a rope is shown that is connected to the spy. Steer it in front of a closed door until the screen flickers and press the fire button once more so that the trap is finished. 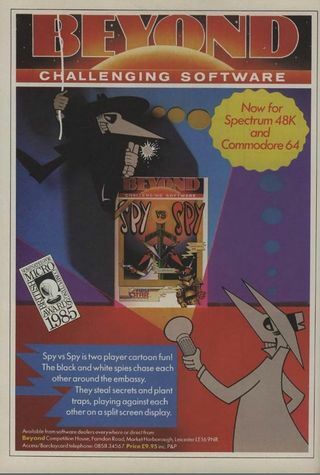 Sledgie: "First part of the 'Spy vs Spy' trilogy on the C64. Fans get their money's worth. The game needs a bit getting used to. In the 2-player mode it is very funny. Godd conversion of the 3D graphics for the C64." Alex (AL71): "The 2-player mode is really great!! :-) But it got boring as I found out first, that you can easily defeat the other spy in the stick fight by keeping the fire button pressed and unhurriedly moving the joystick up and down ;-)." Klaws: "in principle it is a nice game, especially the building and installing of the traps seemed to be a funny thing. Amusing and entertaining. Unfortunately, the game is reduced to a (very simple) wild beating-up, as soon as you meet the opponent... the one who beats the better wins. Pity." Rombachs C64-Spieleführer Teil 2: "Spy vs Spy is a sophisticated action game with a game idea and implementation that can hardly be topped. The one who wants to collect all items in a well-behaved way, will garner nothing but mockery. (vote 2)"
Programmer Mike Reidel poses with the cartoonist of the Spy vs. Spy comic strips Anthonio Prohias for the camera. Spy vs. Spy is a series of comic strips, that is released in the MAD magazine since 1961. 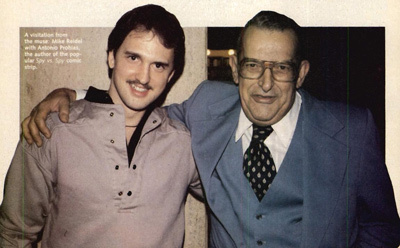 It was invented by the Cuban-American ilustrator Antonio Prohias who designed them until 1990. By now the strips are penned by Peter Kuper but in every comic is written in Morse "BY PROHIAS" or in the German editions "VON PROHIAS". The dialogue-free short stories are about two spies, a white and a black spy who try to steal the secret information of the other one. For this they harm each other in the style of Tom and Jerry. The typical course is that a spy has a seemingly ingenious plan to harm the other one, but the other spy has already seen through it and has thwarted the plan. In some rare comic strips a grey female spy appears that then defeats both spies. 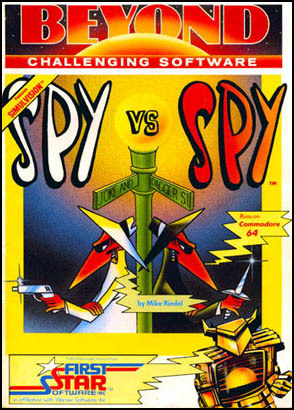 Next to the comic also a board game and several computer games of spy vs spy were released. They also appear on MadTV in animated shape. In 2004 Pepsi had the two figures licensed for a TV comercial spot for Mountain Dew in the USA.